Wow...it's been awhile since I've visited my blog. It's been a busy start to a fun year. I'm finally getting around to posting my friend Ariel's nursery. We were college roommates, now best buddies, and she happens to also be an Interior Designer. :] We both have kids now and well, we both LOVE design, therefore our kids reap the benefit. This is Bennett's nursery, also designed for No.2 in mind. Choosing a gender neutral palette and investing in quality pieces of furniture will allow for an easy re-use of the nursery scheme. Save the uberstylish gender specific rooms for the big kid rooms, when they appreciate it and want a say. 2. Ouef Sparrow Crib in Grey | LOVE the grey. 3. The nursery isn't large, so they customized Bennett's closet and created a changing table and cubbies for easy organization. The armoire stores all Bennett's hanging clothes. 4. Monte Luca Glider with contrasting orange pillow - Love the contrasting welt. 5. Pottery Barn Yellow dot rug. Unfortunately this rug isn't available; however, I found one on Olioboard via Ebay! Even though the overall scheme for the room was orange, brown and grey, the yellow and white rug helps tie in the yellows in the tree on the wall, and in the artwork. 6. Tree on wall was painted by her mom, who happens to also be an excellent interior designer. Notice the adorable hearts on the tree. It's my Ariel's and her husband's initials with wedding date. So cute!! 9. Croche animal mobile. It was a gift and she's not sure where it is from. So, what do you think? 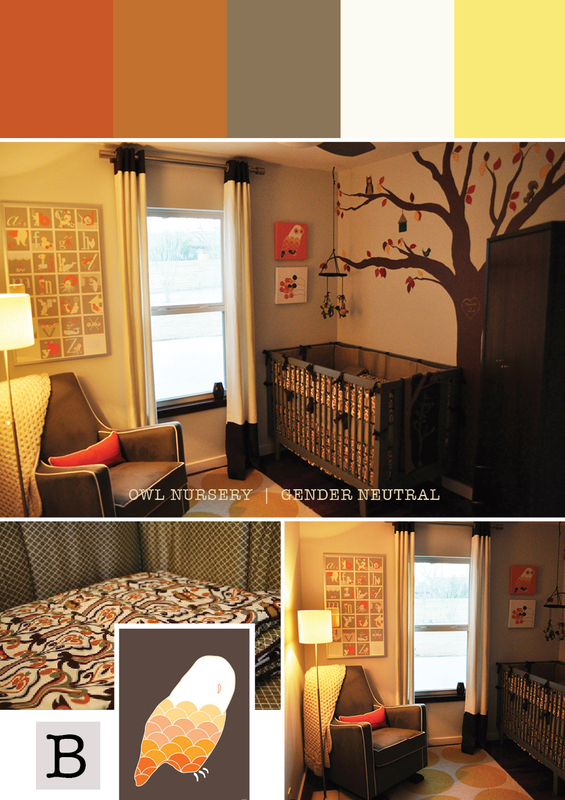 I love it, and love that she created such a meaningful nursery that was gender specific and can be reused. Thanks Ariel for sending the cute pics! I'm sure Bennett loves his room!